Publish to Retract: A new paradigm for research? Retraction Watch has a story about a retraction accompanied by a blog post by the senior author – who requested the retraction. The senior author receives great credit for her transparency and integrity – no doubt well deserved. But this is not the first time that a senior author has found a “mistake” in a publication and has then initiated a retraction. I observe that a paper retracted at the request of the author(s) usually leads to the general and admiring approval of the Journal and of peers. It has none of the stigma attached to a paper retracted by the Journal for plagiarism or data falsification or some other wrongdoing. But looking through my jaundiced and cynical eyes, I wonder if this is just the start of a new paradigm in a brave new transparent world of research publication and retraction. Publish or Perish then gives way to Publish to Retract (or more accurately Publish quickly – to Retract if bad) which is then the name of the game. Publication can then be very much faster and the potential downsides of mistakes or faulty analysis getting through to publication can be converted into the perceived benefits of transparency and integrity if the failings are ever discovered. A hundred or so years ago it was not unknown for applicants to the Indian Civil Service to include something like this in their CV’s. It was of value for the applicant then to show that he had been accepted to sit for the exam. Having successfully run the gauntlet of peer-review in getting a paper accepted for publication (even if later retracted) could similarly be of some value. Posted in Academic misconduct, Science, scientific misconduct | Comments Off on Publish to Retract: A new paradigm for research? Just normal human behaviour from a man in a white coat. A scientific journal has retracted a study by an Upstate Medical University researcher accused of using fake data. The paper was authored by Gerold Feuer, who was found guilty last year of using state money and employees to benefit his private biotechnology company. The article, first published in 2008, was retracted Oct. 4 by the journal Stem Cells. It focused on a virus that causes cancer in humans. Feuer, 53, of the town of Onondaga, landed $6.2 million in state grants in 2009 for stem cell research at Upstate. He oversaw a lab that bred mice without immune systems, then “humanized” them with stem cells to mimic the human immune systems. The mice are used in research studies. Upstate suspended Feuer without pay in late 2010 while investigating his management of a research contract and the way he was operating his lab at Upstate. In 2008 Feuer had started his own private company to develop the same kind of mice for use in testing by universities and companies. Upstate brought 53 charges of misconduct against Feuer, accusing him of using Upstate’s employees to perform services for his company and charging the cost to a state grant. An arbitrator reviewed the case and in an Aug. 20, 2012 decision found Feuer guilty of 30 of the 53 misconduct charges. But the arbitrator said Feuer never intended to personally profit from the arrangement and should be reinstated. Upstate reinstated Feuer, a tenured professor of microbiology and immunology, Feb. 18 at an annual salary of $116,196 and placed him in an undisclosed off-campus assignment. It’s unknown what effect the latest misconduct finding will have on his employment status, said Darryl Geddes, an Upstate spokesman. Upstate officials said they completed a separate investigation in April that found Feuer and Prabal Banerjee, a co-author of the paper, guilty of scientific misconduct. Banerjee now works for Feuer’s company, HuMurine Technologies Inc. Upstate officials said two other researchers involved in the study, Michelle Sieburg and Elizabeth Samuelson, did not do anything wrong. Upstate has requested retractions of two other papers by Feuer published in other journals. Following on from the publicity surrounding the Diedrik Stapel case, a new survey of medical researchers in Flanders confirms that fraud is fairly prevalent. This takes the form of making up data, manipulating data to make it match a hypothesis, plagiarism, double publishing (self-plagiarism), withholding undesirable research results, undeserved authorships or dividing research into as many separate science articles as possible (salami slicing). The article by Reinout Verbeke and Joeri Tijdink was produced with the support of the Pascal Decroos Fund for Investigative Journalism. One in twelve medical scientists admits to making up or ‘massaging’ data in order for it to match a hypothesis. And almost six in twelve see such fraudulent practices happening around them. They identify high publication pressure as one of the causes. Ivan Oransky of Retraction Watch points out that for the medical research fraternity the high rewards from pharmaceutical companies can also play a role. 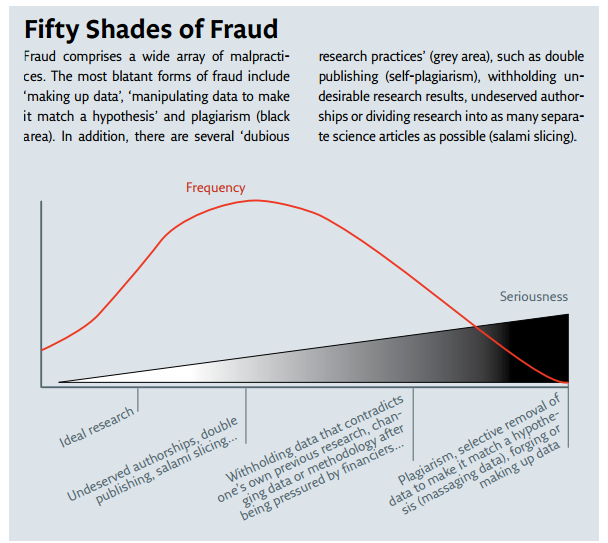 In November and December 2012 Belgian science journalist Reinout Verbeke (editor of Eos Magazine) spread an anonymous survey on fraud and pressure to publish among scientists of the Medical Science faculties of all Flemish universities. …….. Psychiatrist and researcher Joeri Tijdink (VU University Medical Center Amsterdam) collaborated on the survey. He did another sounding in 2011 in the Netherlands, before the scandal surrounding Diederik Stapel had broken out – the social psychologist who had made up data and experiments. For years nobody had been on to him. Stapel and his unsuspecting doctoral students and co-authors even made top magazines with their fictitious studies. Luckily though, such large-scale fraud is rather rare. ……..
Scientific American reports on this story here. Scientific retractions increasing sharply but is it due to better detection or increased misconduct? Retractions of scientific papers is increasing sharply. I am a strong believer in the Rule of the Iceberg where “whatever becomes visible is only 10% of all that exists”. And while I do not know if the number of retractions of scientific papers is increasing because detection methods are improved or because scientific misconduct is increasing, I am quite sure that the misconduct that is indicated by retractions is only a small part of all the misconduct that goes on. What is clear however is that the world wide web provides a powerful new forum for the exercising of a check and a balance. It provides a hitherto unavailable method for mobilising resources from a wide and disparate group of individuals. The success of web sites such as Retraction Watch and Vroniplag are testimony to this. And the investigative power of the on-line community is particularly evident with Vroniplag as has been described by Prof. Debora Weber-Wulff’s blog. And this investigative power – even if made up of “amateurs” in the on-line community – can bring to bear a vast and varying experience of techniques and expertise which – if harnessed towards a particular target – can function extremely rapidly. The recent on-line investigation and disclosure that an award winning nature photographer had been photo-shopping a great number of photographs of lynxes, wolves and raccoons and had invented stories about his encounters was entirely due to “amateurs” on the Flashback Forum in Sweden who very quickly created a web site to disclose all his trangressions and exactly how he had manipulated his images. This week, some 27,000 freshly published research articles will pour into the Web of Science, Thomson Reuters’ vast online database of scientific publications. Almost all of these papers will stay there forever, a fixed contribution to the research literature. But 200 or so will eventually be flagged with a note of alteration such as a correction. And a handful — maybe five or six — will one day receive science’s ultimate post-publication punishment: retraction, the official declaration that a paper is so flawed that it must be withdrawn from the literature. … But retraction notices are increasing rapidly. In the early 2000s, only about 30 retraction notices appeared annually. This year, the Web of Science is on track to index more than 400 (see ‘Rise of the retractions’) — even though the total number of papers published has risen by only 44% over the past decade. …. In surveys, around 1–2% of scientists admit to having fabricated, falsified or modified data or results at least once (D. Fanelli PLoS ONE4, e5738; 2009). But over the past decade, retraction notices for published papers have increased from 0.001% of the total to only about 0.02%. And, Ioannidis says, that subset of papers is “the tip of the iceberg” — too small and fragmentary for any useful conclusions to be drawn about the overall rates of sloppiness or misconduct. Instead, it is more probable that the growth in retractions has come from an increased awareness of research misconduct, says Steneck. That’s thanks in part to the setting up of regulatory bodies such as the US Office of Research Integrity in the Department of Health and Human Services. These ensure greater accountability for the research institutions, which, along with researchers, are responsible for detecting mistakes. A graphic of retractions is here. The academic and scientific community will – perforce – mirror the surrounding society it is embedded in. Standards of ethics and instances of misconduct will follow those of the surrounding environment. But the scientific community is somewhat protected in terms of not often having to bear liability for what they have published. Having to bear some responsibility and face liability for the quality of what they produce can be a force which will improve ethical standards immensely. Bringing incompetent or cheating scientists to book is not an attack on science. And it is what science needs to regain some of the reputation that has been tarnished in recent times. With the spotlight that is now available in the form of the world wide web, I expect the level of scrutiny to increase and this too can only be a force for the good. Posted in Academic misconduct, Ethics, Media, Science, scientific misconduct | Comments Off on Scientific retractions increasing sharply but is it due to better detection or increased misconduct?